about is perhaps the most fascinating question of all time. The direct evidence for human evolution has increased enormously since the early 1990s via the discovery of hundreds of new fossils, including three new genera and even more new species; and via the comparisons of modern and ancient deoxyribonucleic acid (DNA). Great leaps forward are being made in science because of this proliferation of information. Humans and our ancestors are called homin ins, going back to the time of the split from the lineage of human's closest relatives, the chimpanzees. (Until recently the term homin id was used, but based on genetic relatedness and the rules of zoological nomenclature, the word hominid should apply to both the chimpanzee and human clades [lineages].) Humans have evolved various traits that have diverged from the typical great ape collection of characters; notable is human's commitment to standing on two legs (bipedalism) rather than four, increased fine motor dexterity making possible extensive use of tools, prolonged period of infancy and childhood, increased brain size, language, great cultural complexity and economic interdependence. During the Miocene epoch (23 to 5 million years ago), when our super-family, the Hominoidea (apes) flourished and speciated, more than twenty genera and about twice that number of species in the Hominoidea family. Many of these species went extinct, and today there are only five genera of apes: gibbons, orangutans, gorillas, chimpanzees/bonobos, and humans. The origins of the hominins remain obscure. Genetic comparisons and the molecular clock suggest that the human-chimp lines split in the late Miocene about 6 million years ago. The fossil record is very incomplete at this time, and neither fossils of ancestral chimpanzees nor fossils that are clearly ancestral to both lines are known. However, field research since the mid-1990s has resulted in several fossils from this time period, and researchers hope that this trend of discovery will continue and scientists' understanding of the origin of hominins will improve over the twenty-first century. Scientists do know this: Hominins evolved from an ape that was similar to the living African apes, and the human lineage did not spread beyond Africa into Eurasia until about 1.8 million years ago. The early hominins lived in an array of habitats, but most evidence points to wooded savannas (a type of grassland) as a principal one. There is solid evidence that significant amounts of bipedal behavior preceded other major events such as increased brain size or tool use. The earliest named hominin, Orrorin tugenensis, was discovered in 2000 in eastern Kenya, and is believed to have lived 6 million years ago. Thigh bones suggest that this species spent a significant amount of time bipedally. In the 5-million-year time range there are several fragmentary fossils from East Africa, but they are difficult to associate with particular species. At 4.4 million years ago, another genus and species, Ardipithecus ramidus, is present. This species has many traits, especially in the teeth, that are between chimpanzees and later hominins (australopithecines) in size and character (for example canine size, enamel thickness, and size of the cheek teeth). Discovery of a third new early hominin, Kenyanthropus platyops, was published in 2001 by Meave Leakey and colleagues. Between 3.9 and 2.0 million years ago there was a proliferation of australopithecine species, including the "gracile" australopithecines of the genus Australopithecus, with five commonly recognized species, and the robust australopithecines of the genus Paranthropus, with three commonly recognized species. These australopithecine species are variable, but general trends include: significant amounts of terrestrial bipedalism, with some species also retaining significant arboreal adaptations; brains still very close to chimpanzees' in size; tool use generally minimal; very large grinding cheek teeth and chewing muscles, consistent with a largely vegetarian diet including many tough foods; canine teeth reduced in size; and male body size much larger than females (that is, high degrees of sexual dimorphism). The origins of the human genus Homo is also being reexamined in the early twenty-first century. There are many fossils in the 2.4- to 1.6-million-year time range in Africa that have variously been assigned to Homo habilis, Homo rudolfensis, or Homo species, but many still have large cheek teeth, smallish brains, and faces shaped like australopithecines. Some of these fossils even retain many arboreal adaptations. Thus the majority of these specimens will probably be moved into the genus Australopithecus; reserving the genus Homo to include only those specimens which are clearly more closely related to humans. Considered this way, the human genus evolved nearly 2 million years ago with the appearance of Homo ergaster. Homo ergaster, personified by the amazingly well-preserved West Turkana skeleton of a twelve-year-old boy, is a markedly different creature than australopithecines, though still not modern. They were tall, lanky, long-legged with body proportions nearly the same as modern humans, committed to efficient terrestrial bipedalism at the expense of arboreality, and larger—about the size of modern humans. This increase in body size was accompanied by an increase in brain size—the largest examples having cranial capacities (brain cavities) of about 900 cubic centimeters (cc), the smaller examples closer to 650 cc. (Modern human brains are about 1300 cc, chimpanzees are about 400 cc.) Because of the increase in body size, this is not a large relative increase in brain size over earlier hominids. The trend toward increasingly large cheek teeth is reversed in our lineage: There is a reduction in cheek tooth size, generally thought to reflect consumption of higher quality foods and/or more food preparation. Homo ergaster also used tools. The earliest archaeological sites, which contain the debris of stone tool manufacture and animal bones eaten by hominins, date to 2.6 million years ago in Ethiopia. The earliest stone tools are simply sharp flakes broken off rocks that were used as cutting tools. It is difficult to say which species made and used these earliest tools, in fact it probably included some of the australopithecine species. By 1.5 million years ago the stone tool industries include more elaborate, symmetrically flaked rocks, called Acheulian hand axes. Immediately after the evolution of Homo ergaster there was an initial, but probably short-lived, spread beyond Africa into the Near East, Far East (Java), and southern Spain. Either something about H. ergaster or the environment must have facilitated this spread. Was it the increase in body size? Did their ecological position shift up as they became more successful at acquiring meat, and therefore their home ranges needed to increase to encompass more and more space? Was it learning to control fire? Or changes in social organization? 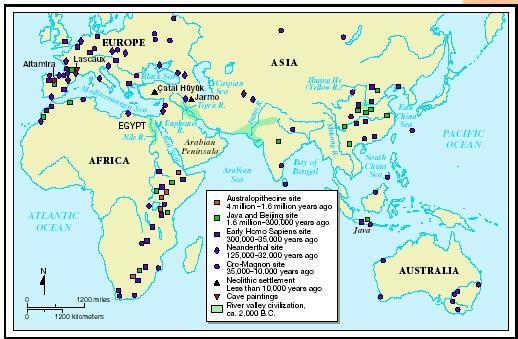 More research will focus on these questions, but whatever caused this initial spread, there is very little evidence for Homo outside of Africa again for about 1 million years, when more sites are found around Europe and Asia. The populations in the Far East (China and Indonesia) evolved into a local species called Homo erectus, which may have survived until into the Late Pleistocene (approximately 50,000 years ago). These fossils have long low skulls with thick brows and cranial capacities near 1000 cc. Interestingly, H. erectus seems to have been contemporary with other species of archaic Homo, specifically species that evolved into Homo neanderthalensis in Europe and the Near East, and another that evolved into anatomically modern humans (AMH) in Africa. All of these species have long, low skulls, big faces, and large brow ridges, but differ in details of the cranial anatomy, and some have larger cranial capacities. They are robust with massive skeletons and muscles, reflecting a large dependency on brawn to cope with the world. Archaeological evidence for accomplished hunting in the form of wooden spears is clear by 400,000 years ago. In Europe Neanderthals evolve into their classic form: extremely strong, stocky, and robust, with large eyes and noses and jutting faces; their bodies seem well adapted to the cold Pleistocene. Their tool kit was more elaborate, including stone-tipped spears, and archeological and isotopic evidence indicates a great reliance on meat in the diet. Nonetheless, except in a very few instances when Neanderthals were contemporary with modern humans, there is little to no evidence for art. For this reason, many anthropologists believe Neanderthals did not have modern language. Meanwhile, archaic Homo evolved into anatomically modern humans in Africa. Throughout this time range (between 200,000 and 100,000 years ago) there are increasing bits of evidence for art and symbolism in the form of red ochre, beads, and composite tools in Africa while they are still absent in Europe, and it is during this period that genetic evidence from modern humans suggests that anatomically modern humans evolved. Indeed, the earliest anatomically modern humans fossils come from Africa and the Near East, just over 100,000 years ago. Anatomically modern humans are characterized by a reduction in skeletal robustness and strength, probably related to greater reliance on technology and culture rather than brute strength. Cranial capacity remains about the same as in the more robust predecessors, but the face and teeth are smaller, the forehead becomes high and the chin juts out. Cultural elaboration is evident in increased number of tools types, regional variation in style, more composite tools, and notably, art. There is a minority of anthropologists who consider all the Homo specimens to be from one diverse species. In the early twenty-first century, the majority of anthropologists believe that the fossil, archaeological, and genetic evidence concur that anatomically modern humans evolved in Africa about 200,000 to 150,000 years ago, and spread out from there to Europe and Asia as recently 100,000 to 25,000 years ago (depending on where), replacing the archaic Homo species, for example, Neanderthals and Homo erectus, and these later species may have contributed relatively little genetic diversity to the human gene pool. The information scientists have thus suggests that all humans across the globe today are very closely related to one another. Jones, S., R. Martin, and D. Pilbeam. The Cambridge Encyclopedia of Human Evolution. New York: Cambridge University Press, 1992. Klein, Richard. The Human Career, 2nd ed. Chicago: The University of Chicago Press, 1999. McBrearty, S., and A. S. Brooks. "The Revolution That Wasn't: A New Interpretation of the Origin of Modern Human Behavior." Journal of Human Evolution 39 (2000): 453–563. The newly discovered Kenyanthropus platyops dates from the same era as the Australopithecus but belongs to a previously unknown species. The new skull has a more humanlike face with much smaller teeth. Its name means "the flat-faced human from Kenya."